Contact Dawn Cranford at dsacheerpom@outlook.com, if you have any questions. We are looking forward to working with your daughters this Sunday! It's always a fun day and gets everyone excited for the upcoming season. If you missed online registration, you can still register at the door. All participants should bring a bag lunch and don't FORGET water. Please have your daughter wear black shorts, tank top, sneakers and their hair pulled back in a ponytail. We will be giving the girls their clinic shirt to wear! See you Sunday! DSA is a volunteer organization dedicated to providing an enjoyable, rewarding sport experience to children and their parents. We receive NO public funding and our success is the RESULT of the WORK DONE BY OUR VOLUNTEERS. Parent(s) of each participant are to volunteer in the Concession Stand located at Damascus High School. All parents/guardians are required to volunteer the number of hours requested to assist with their child’s current sport’s program. If a volunteer is unable to fulfill a position, a replacement must be found. If an assigned position is left open and unaccounted for, that volunteer’s membership will be assessed a fee of $100 (must be paid within 5 business days). Additionally, that family’s membership will be placed on hold after the 5 business days and no one registered through this membership will be permitted to participate in any sport until such fee is paid in full. 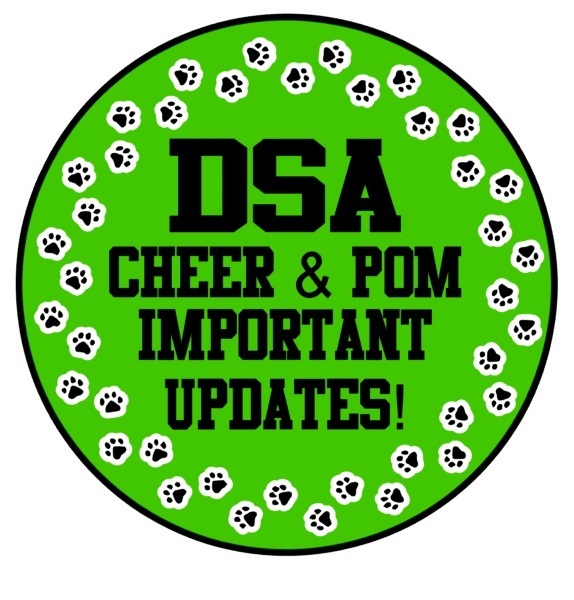 Maryland Identification Cards are mandatory for all players to participate in DSA Cheer and Poms. ID cards can be obtained from the Maryland Motor Vehicle Administration. All ID cards will need to be turned in to your coach by August 22, 2019! We highly recommend obtaining this identification card for your child as soon as possible, as it will take approx. 2 weeks to receive. The instructions on how to obtain a card are located here: (http://www.mva.maryland.gov/Driver-Services/Apply/id.htm.) All players should check the expiration date of their current ID cards. Are you wondering what to do with your children’s outgrown sport clothing and gear? We have a buy/sell page on Facebook to help with this problem called Damascus Sports Swap. It is a site where parents can either buy, sell or trade their gently used sporting gear. 1. All persons involved with DSA including parents/guardians, players, commissioners/coaches, Board Members and umpires/officials shall abide by the Zero Tolerance Policy and all the rules governing the league. 2. It is the duty of all commissioners/coaches to control their players and spectators at all times. 3. No parent or spectator will have any communication with MCPS/school employees or representatives at any time regarding a DSA event. Only commissioners/coaches are permitted to communicate with MCPS/school employees. Anyone in violation will be immediately removed from the field or field area and forbidden to return until disciplinary action(s)/decision(s) have been made. 4. Coaches should teach their players to respect the dignity of the game, the authority of its officials, the value of the opponent and the institutions they represent. 5. Cursing, obscene or threatening gestures or language, harassment of any kind, malicious or personal remarks between opponents, players, spectators or officials on or off the field will not be tolerated and will be subject to disciplinary action. Anyone in violation will be immediately removed from the field or field area and forbidden to return until disciplinary action(s)/decision(s) have been made. 6. Telephone/Verbal/Email/Social Media/In-person assaults, harassment and/ or threats are strictly forbidden and grounds for immediate ban from all DSA activities. 7. Any and all questions, concerns or reports regarding a disciplinary problem(s) and or action(s) can be directed in person to any DSA Board member or by email at damascussportsassociationmd@gmail.com. Any and all information and concerns are strictly confidential and will not be shared with anyone other than the parties involved.